You can benefit from dental implants in many ways. As a matter of fact, we recommend dental implants for our patients who are most likely to benefit. One of the best things about implants: they have a 98% success rate. That means once you have dental implants, you won’t have to worry about failure or fixing them (if you take care of them properly). This is absolutely a great reassurance for patients interested in dental implants. Dental implants are a popular restorative dentistry option for patients. As a matter of fact, according to the American Academy of Implant Dentistry, approximately 3 million people in the United States have dental implants. This statistic demonstrates the popularity of dental implants! But why are so many patients choosing implants for their smiles? We’re about to introduce 9 warning signs that could indicate you need dental implants. Why Do Patients Need Dental Implants? 1. You have missing teeth or a missing tooth. If you are missing one tooth or several teeth, you no longer have to feel ashamed of your missing tooth problem. There is hope, and we are here to help you. Dental implants are a great option (and a popular option) to solve your missing tooth problem. A dental implant will fill in the space where the gap was, and it will look natural like the rest of your smile. So you won’t have to worry about it looking fake or out of place compared to your natural smile. If you have one or more missing teeth, we can help. All you need to do is call us to schedule your first appointment so we can determine if dental implants are right for you. 2. You have loose dentures or loose partials. 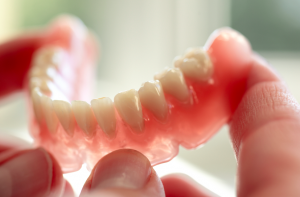 So many people suffer from loose dentures and partials. It’s actually a shame that patients have to experience this, especially since there are other great options out there like dental implants. Dental implants can absolutely fix dentures that become loose throughout the day. You no longer have to feel self-conscious about whether or not the dentures will fall out while you’re trying to eat or talk. The implants will look and feel like your natural teeth, too. There is no more reason to suffer with the many problems that loose dentures can pose. Take advantage of dental implants today! 3. Your tooth has become infected and you need it pulled. If a tooth becomes infected, it can either be saved with certain procedures or it needs to be extracted (pulled out). If you’ve gone to the dentist and he or she told you that the infection is too bad and the tooth cannot be saved, it may be time to get a dental implant. Once the infected tooth is removed, the dental implant will serve as your new tooth. It will be strong and durable just as the natural teeth in your smile. Best of all, there is no special care that you need to practice when having dental implants. As a matter of fact, you should take care of your implants the same way you do your natural teeth—with regular flossing and brushing. 4. You have a loose bridge. 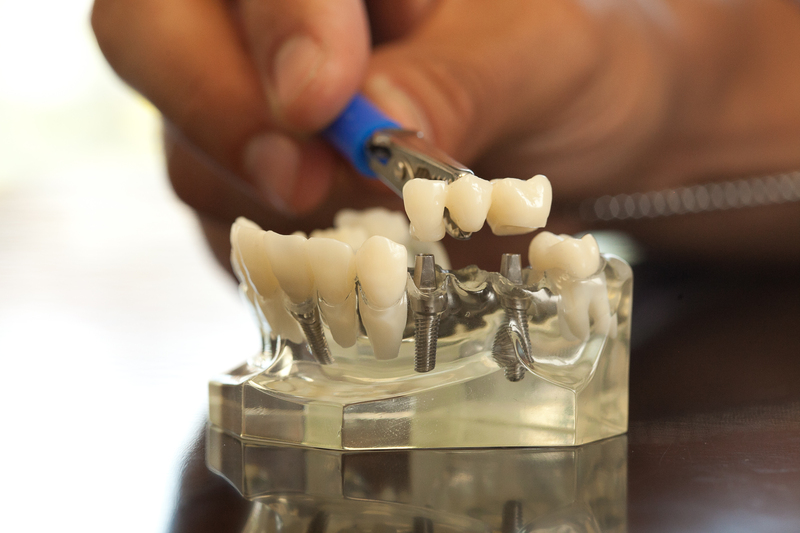 A loose dental bridge can pose the same problems as a loose denture or partial. But dental implants can save you a lot of headaches if you are stuck with a loose bridge! 5. You have a sunken-in facial appearance. Unfortunately, when people choose dentures, his or her face can have a sunken-in appearance. Why do dentures produce a sunken-in look in the mouth and chin areas? This is typically due to the fact that dentures do not stimulate the jawbone in order to encourage the regrowth of critical tissue. Therefore, the jaw ignores the fact that you have dentures, and then the jaw continues to regress (continuing to lose bone as you grow older). The solution to this problem: dental implants. Dental implants will not do this to your facial appearance since the jawbone becomes stimulated when implants are placed (and when you chew, etc). Implants will look and feel just like your natural teeth. Your smile won’t look any different either, meaning that your implants will not look out of place. 6. You are sick of dealing with messy denture adhesives and denture care. If you have ever had dentures, you know the scenario—you take the dentures out to clean them, and then sometimes apply denture adhesives to keep them in place. This doesn’t sound like too much fun for most people. For those patients who do not want to deal with messy denture adhesives, and who want a more convenient option for dental care, dental implants are the best option. As mentioned previously, you do not have to practice a different oral care regiment than you already do. That is because you take care of the implants the same way you do your natural teeth—brush and floss your teeth 2-3 times per day. If you grind or clench your teeth (known as bruxism), this may potentially pose a problem. Bruxism can cause damage to the crown that is placed on top of the implant. To avoid this damaging issue, our dentists may recommend that you wear a bruxism night guard while you sleep. We may also provide certain recommendations to help you deal with teeth grinding or clenching throughout the day to avoid damage to the dental crowns. If you have any questions or concerns about this, please do not hesitate to call us. 7. You have a broken tooth or a severely cracked tooth. If you suffer from a severely cracked or broken tooth, you may not have too many options. You may be faced with only 2 options—a dental crown or a dental implant. We will try to preserve the natural tooth as much as possible. However, depending on the extent of damage, it may be best to extract the remaining part of the tooth and place a dental implant. If the tooth is broken below the gingival line, pulling the tooth out may be the only option you have. Another scenario is when the broken or cracked tooth results in damaged pulp. In this case, you will most likely be at risk for a tooth infection. One of our dentists will determine which type of solution is the best for your situation. All in all, a dental implant will provide long-lasting strength and durability to last throughout the upcoming years. 8. 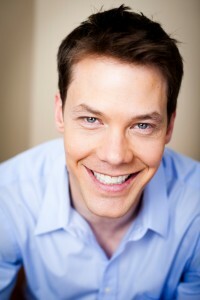 You feel insecure about your smile since you have dentures, partials, or a bridge. For some patients, dentures, partials, or a bridge can still cause you to feel insecure about your smile. No one wants to feel ashamed of his or her smile. You deserve to feel proud of your smile. And dental implants can help. Dental implants will do wonders for your smile. Once the implants are placed, you will feel confident in your new smile. No longer will you feel the need to cover your mouth or refuse to smile and laugh with your friends. 9. You have difficulty chewing food (due to missing teeth). Just ask someone who has a missing tooth—missing teeth poses problems when you try to eat your favorite foods. Whether you need to bite and chew tenderly, or you need to avoid eating certain foods altogether, it is a pain when you’re hungry and all you want to do is eat! With dental implants, you can still eat your favorite foods without hesitation! Don’t suffer any longer with missing teeth problems and difficulty chewing foods—call us today to schedule your consultation appointment. At this first appointment, we can discuss your options, including dental implants, to determine the best treatment method. Are you suffering from any of these 9 problems? If so, you may benefit from dental implants. What’s the next step? Call us at (703) 997-0928. Smiles at Fairfax Corner is located conveniently near shops and restaurants where a lot of people run errands. We can schedule an appointment that fits your daily life routine. At this appointment, we will speak with you regarding your concerns and goals for your smile. We will examine your mouth and other factors to determine if dental implants are right for you. If you can benefit greatly from implants, we can proceed with scheduling a second appointment to get started! If at any point you have questions, please do not hesitate to ask us. We love helping patients understand their treatment.